“All work and no play . . . “ may seem like a strange proverb to open a EverywhereOnce post. It’s true that this blog is about play far more than it is about work. But the writing and photo editing needed to get these posts published requires no small amount of effort on my part; effort that is generally uncompensated. ‘Poor me’ – I know. But it is a self-imposed burden; one that I abruptly stopped carrying about a month back. What I found during my hiatus is that while the pay for blogging is atrocious, this site compensates me in some unexpected ways. I figure I’m like most people, often moving through life with my attention focused elsewhere. If I have trouble remembering what I had for lunch the other day it’s not likely due to poor recall, but because I was probably thinking of something else at the time. And even when I’m engaged in a particularly interesting activity, seldom do I take note of details or reflect upon what I experienced afterward. Such complacency isn’t possible if you intend to write about it later. Details matter in the telling. But to capture them and recall them you have to take pains to notice them in the first place. You have to fully engage in what you’re doing, constantly thinking about what makes this particular experience special and unique, or bland and pedestrian. In short, part of the effort involved in blogging my travels is taking care to live life deliberately; and that is a wonderful thing. Photography is similar in that to do it effectively you have to really see what it is you’re seeing. You have to analyze what makes the image special and decide how best to communicate the complexity of your experience using a medium as static and flat as a photograph. Conveying that experience in a photograph (watching the horses, that is, not watching a scene from Indecent Proposal) required some forethought and planning. If I were at a race I’d probably want an image of several horses, neck and neck, straining toward victory. 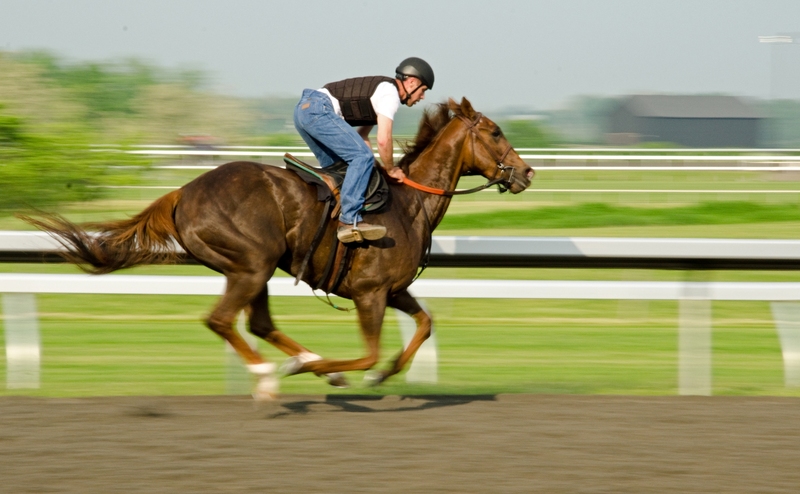 For morning workouts, however, I wanted a single horse, in sharp relief; jockey working him hard. The background blurred into insignificance to focus attention on the subject. Capturing the horse in mid-gallop was essential, but not sufficient to express the animal’s impressive speed; to do that I needed both the background and his feet to suggest motion. The point isn’t so much about photography as it is about story telling, whether with words or with images. In either case, attention to detail is critical. And paying deep attention to the present is not something I generally do without external motivation. Blogging provides that motivation. So I guess it is back to work for me. So glad you’re back! I’ve missed your blogs. Though i don’t often, respond with a comment, I read–and thoroughly enjoy–every one. I was just mentioning to my wife the other day, “I wonder where Wanderings has wandered off to….” I must have missed the I’m-going-on-hiatus announcement. And great photo (as always). Thanks everyone. Good to see I still have some readers left.